This Weekend is Cosas de Mujeres! This weekend is Cosas de Mujeres (Things of Women)! Check out this preview in the Philadelphia Inquirer by Dr. Nancy Heller. 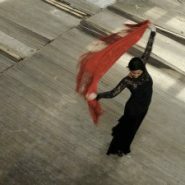 She will also be speaking after the Saturday April 11th performance and present a brief illustrated introduction to the history, technique, and theory of traditionally “feminine” flamenco costume-parts: the bata de cola (dress with a train), shawl, and fan. Dr. Heller holds a Ph.D. in modern art history and has had over 30 years’ experience studying, performing, teaching, and researching flamenco and other forms of Spanish dance.